I was listening to some young guys talk about investment and one asked how can “I invest one million Naira”, guess the reply he got from one of his friends: If you can come by a million naira and don’t know how to invest it, then how did you come by that sum of money? A good answer though, but that did not answer the young man’s question. There was something special about the guy who asked the question, He was curious! Yes, that’s how you know an entrepreneur. I am going to explain how to invest it a million naira from my own knowledge and experience and not as a financial expert or consultant. Now sit back with a cup of coffee and follow me. But please, before you take my advice do some research and weigh your options because it’s the best thing to do. Now not everyone has one million naira, so let us start from how you can save a million naira from your salary. a. Keep 20 to 30% of your monthly salary or earning in a special interest yielding savings account. b. 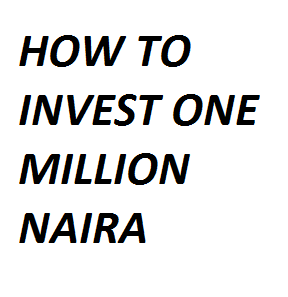 Ensure you don’t touch the money and keep adding to it until you hit the desired target of one million naira. Now, let us discuss how you can invest your one million naira. Money market funds enable individuals with small money to come together and pull funds together to invest. Most of these investments are managed by popular fund managers (STANBIC IBTC assest management, ARM asset management etc). Basically, these monies are mostly invested into big corporations who need to raise funds. The fact remains that your money is in safe hands. According to subomiplomptre, when considering a money market fund, look out for these phrases: “Guaranteed income” & “open ended”. These phrases simply means that should the unforeseen happens, your investment is safe and you may pull out your money at any point in time. If you are willing to invest in money market funds it means you can get 13 to 17% of your investment after a year. The minimum investment plan for money market fund is 1,000 to 5,000 depending on the fund manager. Do your research properly before investing as some fund managers offer higher returns compared to others. You can also invest in treasury bills, though primarily sold by the Central bank of Nigeria you can contact your bank if you wish to invest in it. Depending on your bank, but I sure know the minimum amount you can invest is N50,000. But if you have 50 million naira you can approach the apex bank and discuss a deal. Good news for investors is that taxes will not be deducted from your treasury bills profit. So why waste time? Contact your bank now. But the truth is this, all these investment on treasury bills and money market fund seem a bit complex. Though it may seem so for a start but you just have to try and you will see its easy. Now I want to show you a very simple place to invest your money. With as little as 100,000 naira you can invest in farm crowdy with options of investing in poultry, maize farming, cassava farming etc. but I would advise you invest in poultry as it yields more interest in a short time. You can get up to 18% of your investment in four (4) months. Buying and selling of lands can make you rich within a short time. Don’t mind where the land is located, just buy it. An auntie of mine bought a land for about 200,000 naira some years back, recently she was approached to sell the land for 2 million naira. You can pull funds together with friends and buy lands, when it’s a few years time, you can sell off and share the money. Not many of us know how lucrative fish farming could be, I was discussing with a colleague at the office when he told me rakes in thousands of Naira monthly from his fish farm. Now this is what he does, he buys the fingerlings and nurtures them for two weeks and then sells them off when they are now at the size of juvenile. He buys the fingerlings for N12 and sells them after two weeks for N24. I would have to stop here today, but keep up with my thread for more business tips.